The Browne 98124 steam pan is built with anti-jam technology that makes lifting the pan out of a drop-in, table, or stack of pans simple. Damage is prevented since the edges have been reinforced. This half-size pan is perfect for side dishes with its 7-quart capacity. 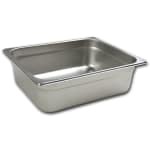 The Browne 98124 steam pan will not easily scratch or stain since it is made of stainless steel. Half-size pan has a capacity of 7 qt.